Sure, continuity errors also come from the serial nature of comic book storytelling, but one of the great joys of the medium is to see one writer pick up the threads of an earlier writer's story and run with it, answering questions and deepening the story in an interesting and cooperative way. Such is the case with Shadowpact: Darkness and Light, where thirteen years after Mark Waid's Underworld Unleashed, Bill Willingham (with Matt Sturges) re-examines the events that lead Blue Devil to sell his soul to the demon Neron in exchange for fame and fortune. 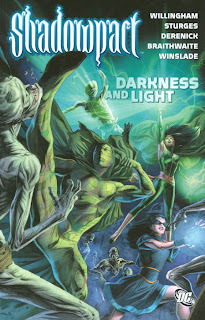 Darkness and Light is hardly a perfect story, but Willingham continues to make the characters remarkably interesting. Blue Devil's penance for selling his soul to Neron, and causing the death of his friend Marla, has been long in coming, and I've been thrilled to see this addressed in Teen Titans and now in Shadowpact. The press conference Blue Devil held was something I frankly thought I'd never see; Blue Devil's new quest now to free himself of his demonic possession even more so. Blue Devil, at base, is similar to Booster Gold in his heroing-for-money, but we've long since seen him come around to being a genuine superhero, and when Nightmaster calls him "the heart" of the Shadowpact, Willingham pegs Blue Devil exactly. One of the best things about Shadowpact has been having Blue Devil back from limbo, and I'm hoping he ends up somewhere else after the pending cancellation of the series. Indeed, all the Shadowpact characters again shine in this trade. Detective Chimp didn't have much to do last time around, but here he calms a schoolbus full of endangered children in a charming scene. I've never felt Willingham adequately fleshed out Enchantress nor Nightshade, but Nightshade gets some impressive moments with her powers (nearly saving all of Chicago), and Enchantress's new mentoring of Warlock's Daughter is quite interesting. I very much liked the scene where Nightmaster recruited the angel Zauriel to the team in Blue Devil's absence, and how Blue Devil's teammates protested Blue Devil's departure. The only Shadowpact character that's seemed to have fallen away is Ragman. Originally one of my favorites, Rory spent most of the last trade on the sidelines, and here he spends most of his time moping about not being effective enough in battle. I hope that while Rory and Nightmaster are trapped in Nighshade's dimension, Rory will find himself with more to do. He's a character, like Blue Devil, that I wouldn't mind seeing join another team once Shadowpact ends. Darkness and Light contains two stories, "The Redemption Contract" and the titular "Darkness and Light." Each of these are fairly decompressed, centered around the Shadowpact fighting their nemesis Dr. Gotham in stories that might've filled just one or two issues, not three each. Both Willingham and Sturges pad the stories with a bunch of subplots (Blue Devil's story, mostly), such that the readers still gets plenty of story pages for their money, but you might look back in the end and be surprised that more didn't happen. Willingham also still has the tendency to switch madcap between scenes (often a page at a time) that's absolutely dizzying. There's also plenty of extraneous dialogue; "Let me extend you to this bus," Nightshade tells Detective Chimp as she does just the same in the panel. There's also a page with the Justice League and the Shadowpact at the end of the third chapter where the heroes blithely summarize the adventure, in a page that might've best been used for something else. There's a nice similarity between Willingham and Sturges's writing styles that makes Darkness and Light an even read despite the two writers. At the same time, there's some variety in the artists here; Tom Derenick handles most of the art, and Phil Winslade's style in the end is very similar. In the middle, however, we get an issue by Doug Braithwaite that looks almost painted, and it's a great spooky style for Shadowpact. I don't see any more of Braithwaite's art coming up in this series, but I would've been happy to see it. Shadowpact ends after the next trade, and I'm sorry to see it happen. After I review the next one, I'll talk a bit more about how I think DC could keep Shadowpact going, despite its untimely end. Comic Books - Not Just for Grownups Anymore?